It’s a story that has been zipping through email boxes. 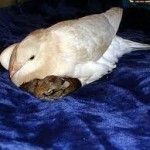 A refuge dove named Noah, once injured himself, took an affinity to three helpless newborn bunnies that were brought to the shelter. Originally there had been five. Attacked by a dog, two didn’t survive the trauma and these three were considered iffy at best. 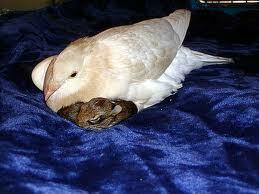 The dove crouched at the door of their cage, cooing that soft lulling sound. One of the bunnies crawled through the bars and nestled under his wing for warmth and security. Eventually, the others followed. All not only survived but began to thrive. I am sure it was pure instinct on that little bunny’s part. But the fact that he was bold enough to leave his littermates and crawl through the bars to find shelter under the dove’s warm feathers, and then by his action enticed his littermates to do the same provides a valuable lesson for us dumb humans. Jesus says that He stands at the door and knocks. Like Noah the dove, He is there just outside of our situation beckoning us to come to Him. But, it is us that have to make the effort to move. The comfort and shelter of his mighty presence in our lives is there if we only have the gumption to remove ourselves from the crowd and, like that little bunny, move towards Him. For that bunny, it wasn’t a giant leap of faith but a few little hops. Still I imagine it took a great deal of effort to muster up enough strength to change his plight. I think it is a human instinct to seek God. It is just that many are either too traumatized or too afraid to move from their present circumstances. One little bunny showed the way for his siblings. But first, they had to see him begin to strengthen. In our lives, it can be the same. If we choose to seek our Lord’s shelter, we will be a witness that He Truly is the Way. I was not there. But I imagine when Noah the dove saw that bunny straining to inch through the bars He extended a giant wing, and said, “Come on. I’m here. Just a bit further. I’ll cover you and protect you.” I know because I have heard Jesus tell me the same thing. After all, by His wounds, we are healed.